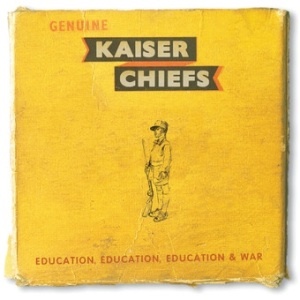 Album Review: Kaiser Chiefs, Education, Education, Education and War. – music waffle. Album Review: Kaiser Chiefs, Education, Education, Education and War. The Kaiser Chiefs have gone from being off the radar, to practically being the radar, with Ricky Wilson’s prime time judging slot on The Voice putting he and the band back in the forefront of the Great British Public’s consciousness. You remember that band don’t you? The ones with the energetic anthems you could happily sing along with – I Predict a Riot, Ruby, and Oh My God. Their signature sound was a “Whoa” that ascended to the clouds and a daft old “Na na na na na”. With the main song writer Nick Hodgson departing the band, and the Brit days being several years in the past, how does the album shape up? The title, based on a Tony Blair speech, purveys that they remain at heart political beasts. There’s an essence of Northern grit and toil, combined with a swath of military references, the centenary of the Great War being upon us. The album opens powerfully with The Factory Gates, a rip roaring commentary about the daily drudge. Lines like “Til they can’t break your will anymore, you are contractually tied to death’s door” and “I record every one of my feelings, by tying bread bags onto the railings” sums up the tediousness and lack of expression that the daily grind can bring. The person as the automaton. The first single, Coming Home, has various interpretations – their comeback to the limelight as a band, or soldiers returning from war, as suggested with the military theme of the fabulous video. As a Yorkshire lass myself, I can only doff my cap at the resilience shown in filming this on the Yorkshire Moors in January. It’s God’s Country, but it’s a perishing one at the best of times, and no-coat Ricky gets a gold medal for sheer northern ness. The song’s Everyman feel lends itself to being used in TV and films, and I’m expecting to hear it cropping up all over the place. It has a rousing and uplifting chorus, and ranks with their very best from the past. Misery Company has a thrust consisting of forced belly laughs juxtaposed with the lyrics, which are about a miserable grunter. “It’s hard to believe that I smile in my sleep, cos everyone leaves me, I’m so hard to keep company, I’m Misery Company”. The root cause – something to do with the stripes on his sleeve I suspect. There is a guitar solo guaranteed to tickle the Music Waffle soft spot (though all smiles of pleasure should be extracted in a thoroughly miserable way of course). Cannons is the most interesting track on the album. Heavy with “Tommy in the trenches” references (“We’re gonna need a lot more cannons, if we’re gonna be home by Christmas”) it kicks off as a normal upbeat song, then goes a bit Monty Python with a manic marching section. Finally actor Bill Nighy interjects with a poetry recital. This seems to be a trend in the music world, following on from Arctic Monkeys use of John Copper Clark’s work in their recent album. Smooth as silk, he tells us about the “millions of civilians in pavilions”. It’s genuinely touching. Kaiser Chiefs remain the providers of a quintessentially British wedge of quirk. They aren’t the most classy or arty band you’ll find, but I don’t think they aspire to be. This a good album you’ll find easy to enjoy. to leave your horse in a stable for long periods of time to avoid the wet muddy spring. Gal Herren – günstig kaufen im Lady Onlineshop Girl Girl Online Store : Hier finden Sie Shopgirl aus dem Sortiment Styles. So können Sie uns einen Artikel aus dem Shop Girl bestellen kaufen! a celebration with greater than 30 guests.